Shanghai -5.8%, -2.6% Hong Kong. 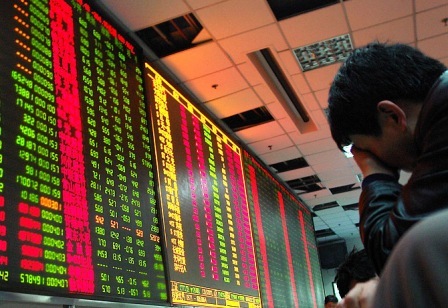 The Shanghai Stock Exchange confirms last week’s losses. Experts: The financial world doubts declared recovery in China. Hong Kong (AsiaNews / Agencies) - The descent of the stock market in Shanghai continued today, with losses of 5.8%, its largest in two months. The Hang Seng index in Hong Kong also suffered losses, closing with -2.64%. Shanghai had already lost 6.6% last week, due to sharp drops in the energy and metals sector, after an increases in prices of petroleum and coal. The analyst Zhou Lin commented to the South China Morning Post that "the market volatility continues today and will continue in the short term, due to the uncertainty surrounding the recovery of the Chinese economy and government policy toward the stock market." Investors are also cautious after the heavy losses in stock markets a few months ago. Beijing had already announced to have overcome the worst of the crisis with a growth rate around 8% but the figure has been criticized by experts because it does not provide sufficient information for a serious review. The losses are also considered the result of a knock-on effect from losses on Wall Street last week and pessimistic U.S. data, which is struggling to show signs of a recovery. Meanwhile, Foreign Direct Investments (FDI) in China continued to decline in the first 7 months of 2009 falling by over 20.3% over the same period in 2008. According to data reported today by Yao Jian, of the Ministry of Commerce, the deterioration was greater in July, with investment of 5.36 billion dollars and a loss of 35.7% compared to July 2008, while in June, the decrease was smaller (-6.8%). In 2008, investment had reached a record level of 92.4 billion dollars. Experts note that the decline may also be a result of the dispute between the Chinese authorities and the mining company Rio Tinto. China has arrested four employees of the firm on charges of industrial espionage, and the company replied that so far it has not been shown any evidence. Many feel that the story is part of battle between Chinese state companies and Rio Tinto to determine the new prices of iron ore, essential for production and the economy of China.